I’m on Day 22 in dealing with a concussion. I guess now that it’s been three weeks, it probably isn’t considered minor – the kind that resolves itself in a few hours or days. But I’m also very lucky that it wasn’t more major: it is progressively healing, and I’m much better off than many others – those that have taken months (or years) to heal or those that didn’t survive. I’ve heard and read all the stories. Three weeks ago – the day that the Twin Cities got a foot of snow, really the only significant snow we’ve had all winter – I was home over lunch and decided to walk the dog before significant accumulation and before a conference call. He did his business about a half-block in, and then he decided to run. Figuring that was good exercise (for him and for me), I acquiesced. 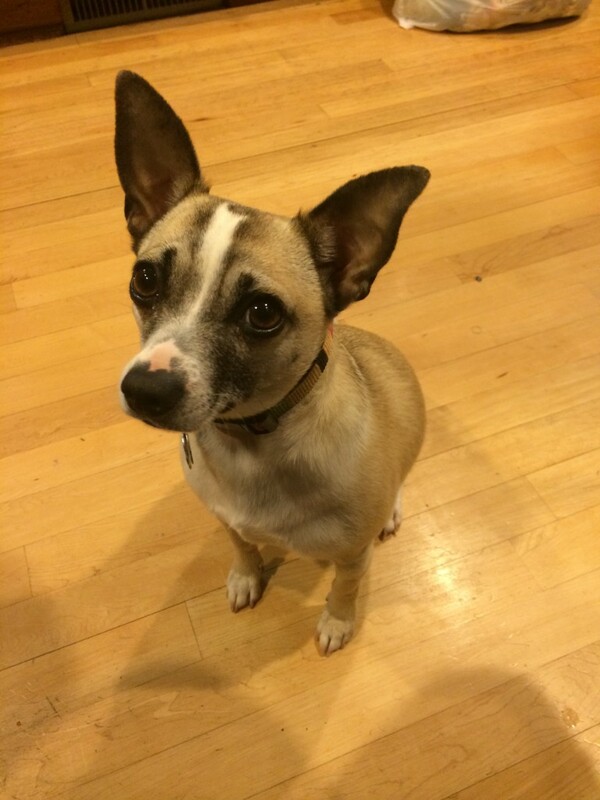 Keep in mind, he’s a Jackchi – a Jack Russell, Chihuahua mix (found abandoned in the New Mexico desert, but that’s another story for another time). I say this because he’s only four inches off the ground. And his runs are usually only a couple of blocks. That day, we made it about three or four houses. As the snow started to increase, it created a thin blanket on the sidewalk, conveniently covering the icy patches that were created by a thaw the weekend before. Ok, you know what’s coming. Unfortunately, I didn’t. Rocky, that’s the Jackchi, hit an ice patch, slid and fell. Pretty significant for an animal that has all-wheel drive. I knew I was next, so in the half-second that ensued, my instinct told me to put on the breaks. Of course, the dress shoes I was wearing (it was, after all, the middle of the business day) provided zero traction, and I joined Rocky on the concrete – feet rising horizontally, parallel to the sidewalk. My back hit first (cracking a rib, I later found out), followed by my head (causing whiplash, I also later discovered). I knew it was a concussion immediately, but I didn’t pass out. I got up (quickly, so no one saw me, of course), walked a couple of more houses, but then had to kneel down as my world started spinning. The rest of my story is pretty quick, and I guess fairly typical as far as concussions go. I experienced all of the hallmarks: dizziness, confusion (at least now I had a built-in excuse! ), some slurred speech, some memory loss, constant headache that lasted nearly a week. The family had some good laughs at my expense. Like the time I came home from running errands and put my car keys in the silverware drawer. Not funny for those suffering from dementia, and actually somewhat frustrating for me, even though I knew – or at least hoped – it was temporary. Fortunately, I never had the symptoms that indicate serious trouble (seizures, fainting, unbalanced pupils, vomiting). And after about five or six days, the symptoms started to dissipate. Now that I’m several weeks in, they’re nearly gone – just an occasional headache and every once in a while, a temporary wave of dizziness. I’m not looking for sympathy: the injury was completely my own fault (running on snow and ice in no-tread shoes! – what was I thinking?!). But it did get me thinking: the whole experience was a process. Think of all of the “steps” I went through to get to the (undesired) outcome of a concussion: the time I chose to walk the dog; the shoes I had chosen earlier in the day; the route I took; the poor decision to run the dog; and then the final poor decision to put on the brakes, which caused my feet to fly out from under me and my noggin to smack the concrete. If any one of those steps were different (different route, different shoes, different decision of not to run), the outcome would have been different. My “process” got me exactly the outcome it was designed to get me. And then there’s the process of healing – most of it I can’t see, but there is a sequence of swelling, cell repair, and so forth, aided by the steps that I have taken: additional rest, painkillers, hydration, and caution to avoid a second injury. By the way, “treatment” for concussions involves limited screen time (computers, TV, smartphone), limited reading, and limited thinking. Luckily, that’s pretty much my job description. So the process of healing, while a struggle at times, seems to be moving thankfully toward a desirable outcome. Just about everything is a process. Brushing your teeth. Commuting to work. Making dinner. Deciding on which house to buy, in which city to live, or which partner to marry. All processes. Some processes are invisible: breathing, digesting, weather events, radio or cell signals that transmit audio, video, or data to your device. Some are extremely complex (like open heart surgery, rocket science, curing diseases); some are simple (taking a shower, watching TV, scheduling a meeting). With that simple definition, I’m going to assert that everything – certainly everything in an organization – is a process. Manufacturing a product takes inputs, transforms them in some way into outputs (finished products) that customers value. Service is also a process: greeting a customer, identifying their needs, delivering on those needs, following up to ensure those needs were met, and so forth. Education is a process: starting with the learner’s current knowledge (through assessment), designing/delivering content or curriculum to move knowledge forward, and then assessing again to see if knowledge was obtained. Healthcare is a process (in-take, triage, diagnosis, treatment, follow-up, and, yes, billing). Analyze the quality of those inputs: are suppliers delivering raw materials according to my organization’s specifications? Determine the best sequence of steps to optimize resources (time, human, and financial) and to produce the highest quality products/outputs. Study decision points in the process, evaluating where errors could take place and how to reduce or eliminate that potential. Reduce bottlenecks or points in the process where materials are waiting. Identify ways to eliminate steps, speed up steps, or otherwise improve the efficiency and productivity of a process. And so on. I think many organizations do a fairly good job at evaluating their core processes, be they manufacturing, key service processes, education, clinical healthcare, and so forth. But I’ve seen many organizations struggle to apply that same process rigor to secondary or support processes – processes like recruiting and hiring employees; training and developing talent; employee evaluation, performance management, and recognition; communication; governance; strategic planning; customer relationship management and engagement; building and sustaining the organization’s culture; leveraging core values; engaging employees; managing knowledge; research and development; sales and marketing; and decision making, just to name a few. These processes are also all key for any organization, but they are much more difficult to design, analyze, measure, and improve. 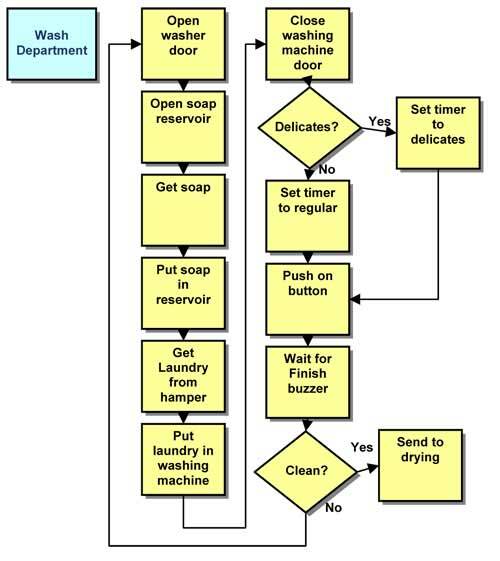 Here is a very simple process to design a process – it’s not sophisticated, but it can be useful in helping to understand how processes work. Step 1: Identify the customer(s) of a process. Step 2: Identify customer(s) requirements of the process. Step 3: Identify desired outcomes of the process – the products/services that would be desired by customers given their requirements. Step 4: Identify the start of the process – the trigger, the raw material, the input that starts the sequence of activities. Step 5: Identify the supplier(s) of those inputs and the requirements the organization places on those suppliers. Step 6: (Re)design the sequence of activities and decision points needed to transform the input(s) into desired output(s), given customer requirements. Step 7: Identify measures that will help monitor process effectiveness – both in-process measures (leading indicators) and outcome measures (lagging indicators) that help workers and leaders determine if the process is operating correctly. Step 8: Implement the process, measure, evaluate, and improve. If that simple rubric – that simple process – were to be used on every process within your organization, image how effective you and your team would be at evaluating and improving every process important to your customers and your employees. I’ll close with this, further proving that really everything is a process. Last week, I ran across a list posted in my 11 year old’s room. 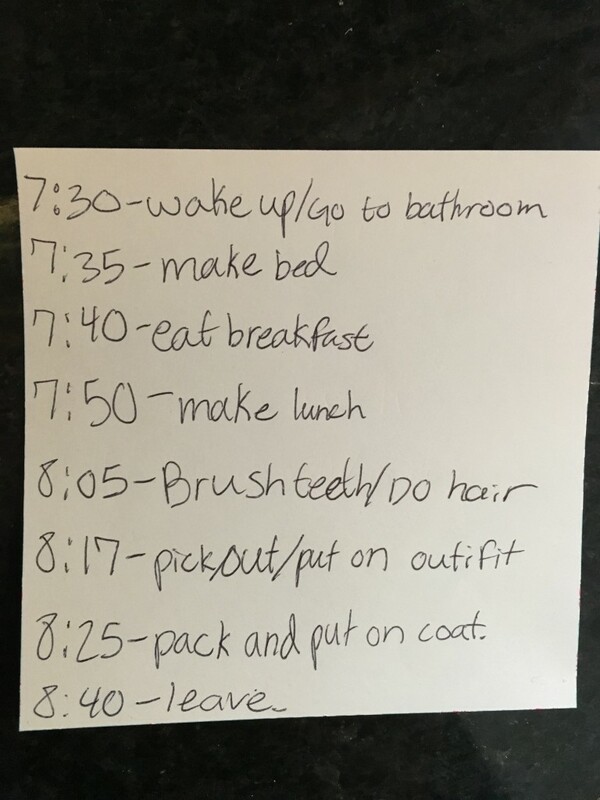 It’s really just her schedule of how she gets ready for school every morning – she designed the process herself (I guess she carries the burden of living with a quality professional), and there’s elegance in its simplicity. But if she wants repeatable, predictable, consistent performance every morning – getting to school on time, without stress or rush, and with everything she needs – then she’s learned she has to follow a similar set of steps every day. She told me she’s tinkered with the sequence and timing, I guess indicating she’s evaluating and improving the process continuously. Pretty cool for a fifth grader. And if she can learn from dad’s mistakes (that is, someone else’s poorly designed process) and not run to school on icy sidewalks, she’ll have a good outcome just about every day! What comments do you have regarding the importance of managing everything as a process? What tips do you have in measuring, evaluating, and improving processes? Participate in a discussion on this topic: visit our LinkedIn group to post a comment. And follow me on Twitter @LassiterBrian!